Regiment/Catrawd: 27th Battalion, Canadian Infantry (Manitoba Regiment). Service Rank and Number / Rheng gwasanaeth a rhif: Sergeant No. 622079. 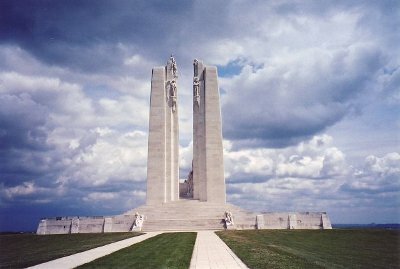 Military Cemetery/Memorial / Fynwent milwrol: Vimy Memorial, Pas de Calais. Ref No Grave or Memorial / Rhif cyfeirnod bedd: None. Killed in action on Friday 9 August 1918 during operations west of Rosieres and after the Company had reached the objective for the day at about 7.30pm. He was killed by an enemy shell which landed nearby. (Rosieres is situated in the Haute-Loire area (Auvergne region) in the southern-centre of France, 13km from Le Puy-en-Velay). Henry Telford Hughes was born in Rhyl, Flintshire, North Wales on 15 August 1883. The 1891 Census shows that the family lived at 6 Kinmel Street, Rhyl, Flintshire. The head of the family was Robert Hughes aged 50, who was employed as the Rhyl Town Surveyor. His wife Mary Elizabeth Hughes aged 42 and their 9 (nine) children – Ada Hughes aged 21, a Dress Milliner, Florence Hughes aged 16, Edward Norman Hughes aged 14, a Telegraph Messenger, Eva Hughes aged 11, Tudor Foulkes Hughes aged 10, Henry Tudor Hughes aged 9, Trevor Hughes aged 5, George Stuart Hughes aged 3 and Mary Elizabeth Hughes aged 3 months. On 29 October 1905, Henry who was now living at 8 Aquarium Street, Rhyl married Margaret Elizabeth Morris of Morfa Bach, Rhyl at Holy Trinity Church, Russell Road Rhyl. By 1911 Henry and Margaret had moved to 11 William Street, Rhyl and had three children – Norman Telford Hughes aged 5, Mabel Eleanor Hughes aged 3 and Albert Hughes aged 11 months. On Friday 26 April 1912, Henry emigrated to Canada with his brother George Stuart Hughes They sailed from Liverpool, England aboard S.S. Virginian. arriving in Grosse Isle, Quebec at 2am on 6 May 1912. Henry obtained employment as a Plumber. His wife Margaret and their children followed him to Canada arriving in Quebec on 7 August 1913. They initially resided with Henry’s sister Eva and her husband Vernon Rhydwen Jones before eventually moving to live at 260 Royal Avenue, West Kildonan, Winnipeg, Manitoba. 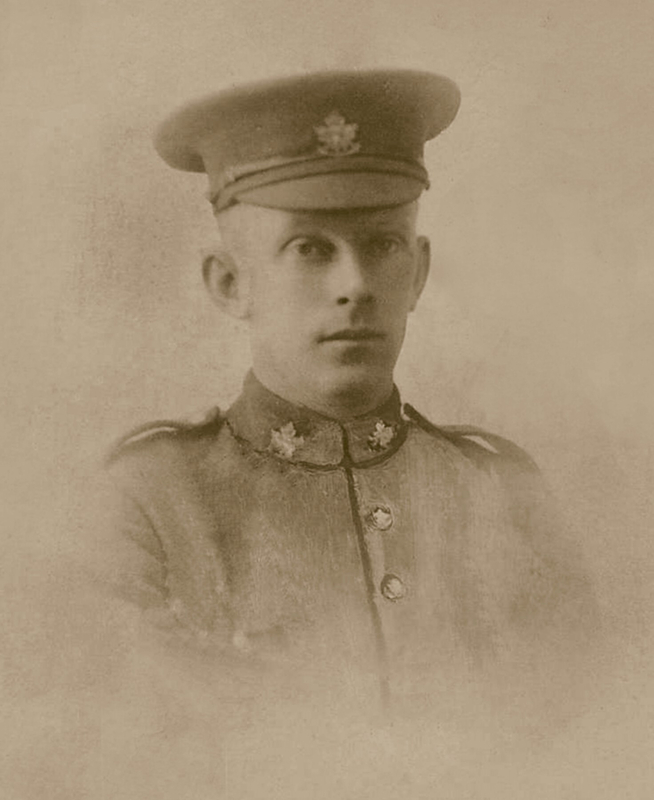 On Friday 15 January 1915, he enlisted as a Soldier with 27th Battalion, Canadian Infantry (Manitoba Regiment). His Attestation Record describes him as 31 years of age, 5’9″ tall, Chest Measurement 36″, Expansion 2″. His physical development was described as good and he was passed fit for military service. 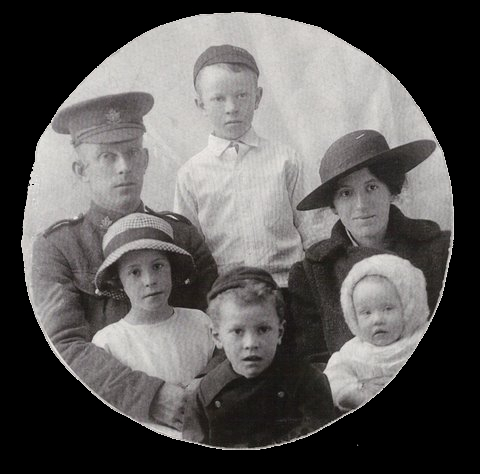 Family photograph, Henry Telford Hughes , son Norman Telford Hughes, wife Margaret Hughes, daughter Mabel Eleanor Hughes and sons Albert Hughes and Robert Bennett Hughes. This was the last photograph of Sergeant Hughes before he left Canada for the Western Front. Canadian Pacific telegram sent from Ottawa August 20, 1918 to M. E. Hughes at 260 Royal Avenue, West Kildonan, Winnipeg, Manitoba 10019. 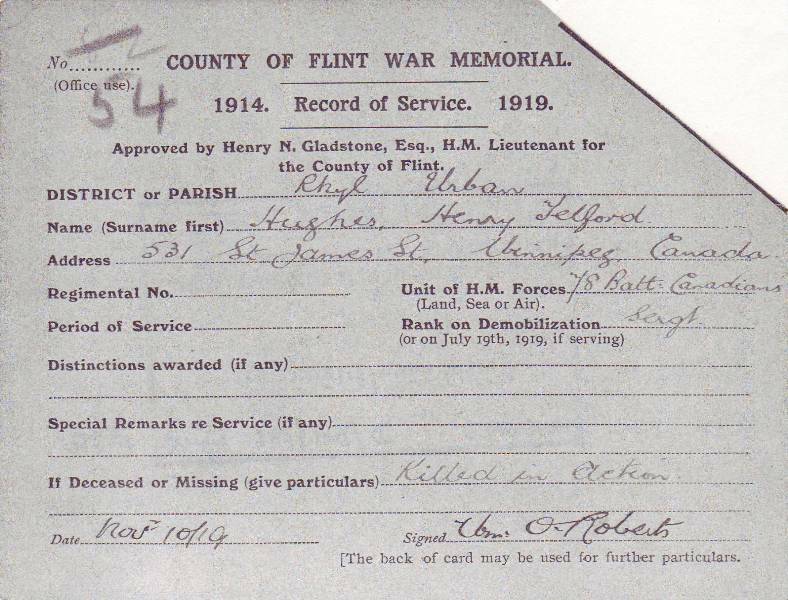 Deeply regret to inform you 622079 Private Henry Telford Hughes, Infantry officially reported killed in action August 9, 1918. My thanks to Carole Smythe, North Vancouver, B.C. for providing the above two photographs of her Grandfather and family and for further information which has enabled me to update this page. On Saturday 4 December 1915 the following article appeared in the Rhyl Journal. His brother, Tudor Foulkes Hughes name also appears on the Rhyl War Memorial as does his brother-in-law Vernon Rhydwen Jones (44th Battalion Canadian Infantry, who was killed in action on Saturday 31 March 1917).. 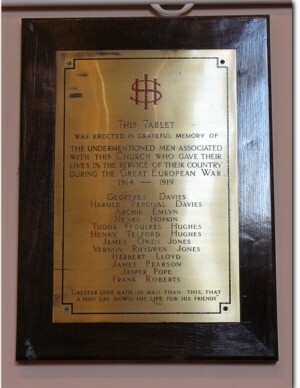 Sergeant Henry Telford Hughes is also remembered on the Remembrance Plaque in the Royal Alexandra Hospital, Marine Drive, Rhyl. On a plaque at St Thomas Church, Rhyl and in Canada on a plaque at St Anne’s Anglican Church in Winnipeg, Manitoba. The Books of Remembrance located in the Memorial Chamber of the Peace Tower on Parliament Hill in Ottawa bear the names of all Canadians who died in the Great Wars of 1914-1918 and 1939-1945 and has Henry Telford Hughes listed on Page 433 of the First World War. The Canadian Memorial United Church at 1811 W. 16th. Ave. Vancouver, B.C. has replicas of these books. There is a Flintshire Roll of Honour Card for him at the County Archives Office, Hawarden, Flintshire which is dated 10 November 1919 and sighed O. Roberts.